Matt is about to start a fight with Roland, but Gemma tells him to stop. Roland leaves telling Matt that Gemma isn't worth it. Matt checks Gemma is OK. She says she's fine, apart from her ego and wishes Matt hadn't barged in the way he did. Mat sarcastically agrees – he'll walk past next time. Gemma admits that she's glad he showed up, but never pictured him as a knight in shining armour. In the kitchen Annabel persuades Ryan to have one pint. Roland storms in, demanding that they leave because Matt went crazy when he saw Roland talking to “that dog who works in the coffee shop”. Annabel won't go with Roland and so he leaves the party without her. In the bedroom Gemma is trying to fix her broken dress – which isn't going to fix. Matt puts him arm around her just as Ryan walks in. They tell him it's not how it looks. Clarrie come sup behind Ryan and isn't impressed with the state of the house and accuses Matt and Gemma of getting up to things before telling them to leave. Clarrie wants an explanation from Ryan. 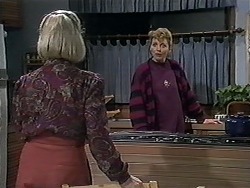 Bev and Helen chat about Clarrie. Bev notices the wine out and asks if Clarrie had any. Helen says she's not telling. It then dawns on Helen that Clarrie is an alcoholic. Bev doesn't confirm it outright, but she doesn't deny it either. Paul gives Chrissie and Caroline the weekend off. They can't believe it. He asks them to do one thing though – attend a cocktail party! Plus Lassiters is supplying the dresses. Paul leaves to get more drinks. Gemma and Matt spot Roland who's hanging about. They guess he's waiting for Annabel, who they think Ryan quite likes. Gemma shivers and Matt gives her his coat. They kiss 3 times and agree to meet tomorrow. Gemma goes home and Matt approaches a drunk (and still drinking) Roland. Matt takes Roland's car keys and tells him to catch a cab or walk home. 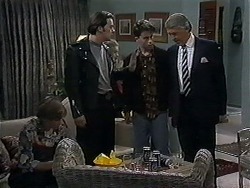 In the background to Ryan being told off, we can hear Roland shouting for Annabel. Eventually Clarrie goes to the door and it turns out to be Matt – who gives Ryan Roland's keys and tell him to call a cab. Roland comes in demanding his keys. Clarrie takes the keys. Helen is helping Clarrie clean up after the party. They can't get a stain out of the carpet and they know Dorothy will go crazy. Ryan comes in with carpet cleaner. Helen spots something else which is wrong – one of Dorothy ornaments is chipped. 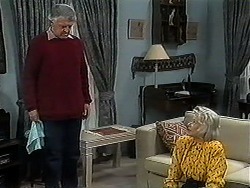 Matt comes in to see Gemma. They agree to go out later after talking about how awful Roland must be feeling this morning. Matt heads over to join Josh and Melissa who are arguing about their songs. Gemma joins in telling Josh to sing to Melissa under the moonlight because she'd love that, Melissa snaps – telling Gemma to go back to her customers. She leaves the money for her sandwich and leaves to clean her room. Matt and Josh chats. Josh says he doesn't know what to do about Melissa. Matt suggests that Gemma's idea might just work – and he'll help. Josh thanks him. Looks like Melissa's going to be serenaded! Paul is waiting for Christina and Caroline. When they both turn up they are shocked – Paul's bought them the same dress! Caroline is angry – he insisted no more work but Paul said it was just too much of a good opportunity to turn down. Caroline insists they won't go if they have to wear the same dress and Christina reluctantly agrees. Ryan comes in to see Gemma – who's just closing. She agrees to have a coffee with him but Annabel turns up after a lemon tea. Gemma says it's fine – they can stay while she clears up. Annabel invites Ryan to a disco – Roland's driving. Gemma says it sounds like an adventure and Annabel asks what she means. GEMMA: I wouldn't get on a skateboard with that boy, let alone in a car. You don't know where you might end up. Gemma declines the invitation of a ‘foursome' to the disco – she going to see Matt tonight. Annabel remarks that two dates together in a row makes them practically an item. Gemma agrees. Ryan looks a tad disappointed. CHRISTINA: I'm so sick and tired of being told that twins should stick together when it suits you and pushed aside when it doesn't. If you cared about my feeling at all you'd support me in this. It's something I really want to do Caroline, so for once will you do it for me?! Say yes.